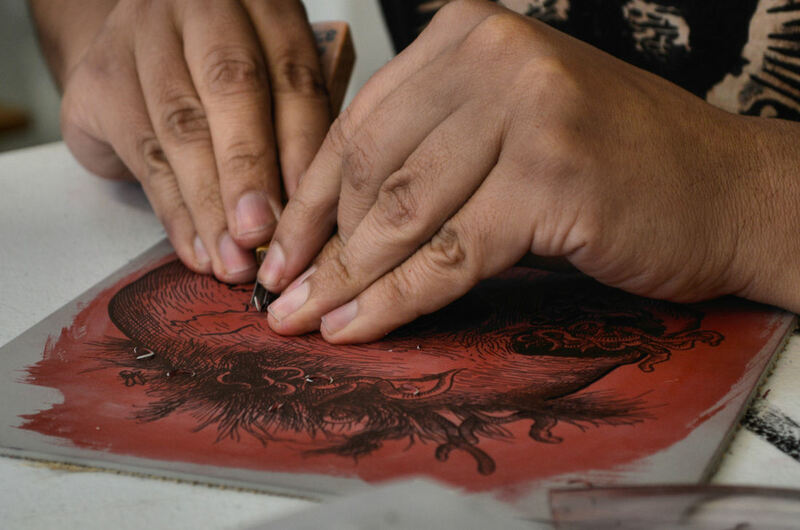 Carlos Barberena (b.1972) is a Nicaraguan self-taught Printmaker based in Chicago, where he runs the printmaking projects: Bandolero Press & La Calaca Press. He is also a member of the Instituto Grafico de Chicago. Barberena is known for his satirical relief prints and the use of images from pop culture, as well as from political and cultural tragedies. In his art, he has consistently reflected on the cycles of repression and resistance and its relationship to the Diaspora in which he has lived, throughout dictatorship, revolution, erasure, renewal, hope, dictatorship and repression. His prints center these types of life experiences occurring far beyond his country. He creates to counteract the great silence around repression occurring globally believing we are all intimately connected to it. He seeks to demystify the “foreign” experience, to bridge the distances that life across any border or wall produces, but also, the difference in the content of these experiences. He creates to bring awareness to the interconnectedness among them, focusing on injustices of social, political, economic and environmental injustice. At time he evokes with satirical images, at others, through the mundane, unseen things people carry: memories, attachments, relationships and traumas. In each he highlight the myriad cycles of oppression and struggle. Barberena has exhibited individually in Costa Rica, Estonia, France, Mexico, Nicaragua, Spain and The United States of America, his work also has been shown in Art Biennials, Museums, Galleries and Cultural Centers around the world, among them: - "Gráfica América" Curated by Gabriela Martínez & Rogelio Gutiérrez, Museum of Latin American Art (MOLAA), Long Beach, CA. USA. - “1st International Academic Printmaking Alliance Invitational Exhibition”/ un-Folding / des-Doblamientos: Metaphoric Resonances in Contemporary Latin American Printmaking / The Imperial Ancestral Temple Art Museum, Beijing, China. - “Back to Chaos / Atpakal Haosa” - American Printmakers - Rigas Art Space, Riga, Latvia. - “The 9th Biennale Internationale d’Estampe Contemporaine Trois Rivieres”, Centre d’exposition Raymond-Lasnier, Quebec, Canada. - “The Future”, SG Gallery, Scuola Internazionale di Grafica, Venezia, Italy. - Featured Artist (Solo Exhibition) at “The 9th Triennial Mondial de L’Estampe et de la Gravure Originale” Curated by Iréne Weiss, Clermont-Ferrand, Chamalieres, France. - “The 7th International Printmaking Biennial of Douro”, Lamego Museum in Portugal. - “Printmaking In / In Graafika Fest”, Linnagallerii, Parnu, Estonia. - “The IX Nicaraguan Visual Arts Biennial” (IX BAVNIC): “Recycling Memory: Recapturing the Lost City”, PAC Museum, Managua, Nicaragua. - “Tartu Printmaking Fest 2014”, Tartu Art House, Tartu, Estonia. - “LAPS 21, National Printmaking Biennial”, Curated by Jack Rutberg, CSUN Art Galleries, Northridge, California. - “Pulso: Arte de las Américas”, KCAD Fed Galleries, Grand Rapids, Michigan. - “Santitos”, Loyola University Museum of Art (LUMA), Chicago. - “Hanal Pixan - Food for the Souls”, Curated by Dolores Mercado, National Museum of Mexican Art, Chicago. - “III Bronx Latin American Art Biennial”, Gordon Parks Gallery, The College of New Rochelle, Bronx, New York. - “Les Saltimbanques”, Musée d’Art Roger-Quilliot - MARQ - Clermont-Ferrand, France. - “III World Body Art Conference”, Lia Bermudez Museum, Maracaibo, Venezuela. - “V Biennial of the Caribbean”, Museum of the Dominican Man, Santo Domingo, Dominican Republic. - “8thTriennial Mondial de L’Estampe et de la Gravure Originale”, AMAC, Galerie d’Art Contemporain, Chamalieres, France. - “6th KIWA”, Kyoto Museum of Art in Japan. - “KIWA” Takanabe Art Museum, Miyazaki, Japan. - “Latin American & Nicaraguan Printmaking”, former Convent of San Francisco Museum, Granada, Nicaragua. - “24 Grafiekbiennale Sint-Niklaas”, International Exlibriscentrum, Stedelijke Musea, Sint-Niklaas, Belgium and “The XIII Art Salon, Identity Imprint: A Glance at Ibero-American Printmaking” at the Mexican Cultural Institute in Washington, DC. Barberena’s work is included in numerous public and private collections, including: Fort Wayne Museum of Art, Fort Wayne, IN. - Wheaton College Art Collection, Wheaton, IL. - Ortíz-Gurdián Museum, - Contemporary Art Collection - Casa Deshon, León, Nicaragua. - The National Museum of Mexican Art, Chicago, IL. - Cannonball Press Editions, Brooklyn, NY. - Museu do Gravura, "Douro Printmaking Biennial Collection", Alijo, Portugal. - Academia Non Grata, Pärnu, Estonia. - Loyola University Museum of Art (LUMA), Chicago, IL. - Museum of Texas Tech University, "Artist Printmaker Research Collection", Lubbock, TX. - University of Colorado at Boulder "Special Collection", Boulder, CO. - The National Gallery, San José, Costa Rica. Museum of Contemporary Art “Julio Cortazar” - Prints & Drawings collection -, Managua, Nicaragua. - Bibliotheca of Alexandrina, "Permanent Art Collection", Alexandria, Egypt. - Benedictine University, Lisle, Illinois. - Kyoto International Woodcut Association, Kyoto, Japan. - The School of Fine Arts, (UNAM), Mexico. The Triennial Prints Cabinet, AMAC, Chamalieres, France. - The International Exlibriscentrum, Stedelijke Museum in Sint-Niklaas, Belgium. - Lia Bermudez Museum, Maracaibo, Venezuela. - Former Jesuit College Cultural Center, Patzcuaro, Mexico and Praxis Gallery, Managua, Nicaragua.